How old was Marco Rubio when he fled to America from CUBA ? Remember everyone that the illegal immigrant kids carry no passport to determine the country to deport them to. 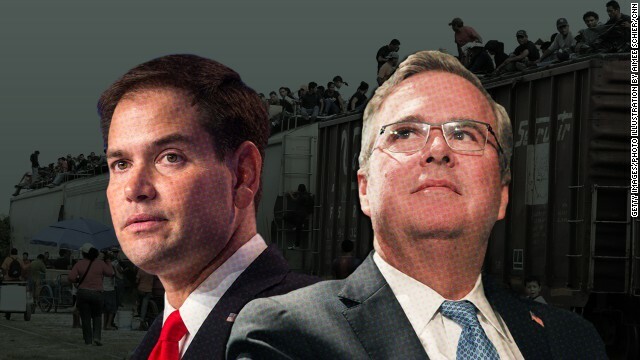 Jeb Bush, Rubio lay low on border crisis and Republican strategist Ana Navarro said that's OK.
"I don't think you have to play a leading role on every issue," she said. Who the hell is she trying to fool? These two of all the wannabees ought to be out front and center from now until election day 2016 regarding this issue explaining what THEY would do, what THEY would like to see happen, and how THEY will go about making this issue THEIR issue. Thumbs in their ears won't cut it nationally. Jeb Bush, Marco Rubio and Rick Perry , often lay low after big events that could require a review of long-term strategy. Tony D: deport everyone here illegally without exception? Watch out, you're compassionate conservatism is showing. Is there something about the word ILLEGAL that you do not understand? Might want to look up the word. It is what our law requires. Why are we not enforcing our laws? Do we even have laws when they are not enforced? Well, now you are seeing the results of that folly. Rubio and Jeb Bush laying low??? You mean like Obama who goes to Texas for campaign fund raisers and refuses to go to the border to see the crisis, the humanitarian disaster HE HAS CAUSED?